At the University of Northern Colorado, game days are always exciting. But the Division 1 school wanted to take fan enthusiasm to the next level. 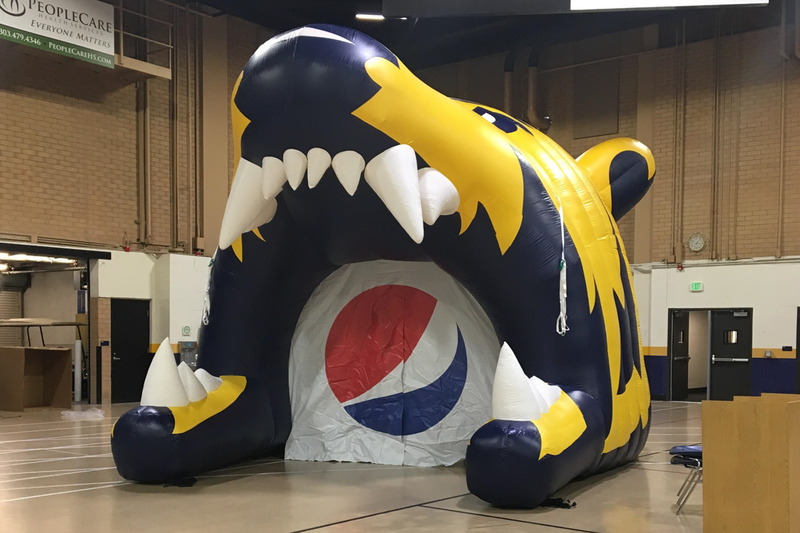 So, they asked Landmark Creations to build an inflatable sports tunnel, specially designed to resemble Klawz, the UNC Bears' famous mascot. Working closely with Leslie Trujillo, Director of Marketing & Fan Experience, Landmark created a "nearly exact replica" of the legendary bear head... complete with fierce jaws, frightening teeth, and ferocious expression. At home games, student-athletes burst through the "bear mouth" and race out onto the field, while the stands erupt with cheers and applause. Why did Leslie turn to Landmark to craft the Bears' inflatable replica? "They provided the best price," he says, "with great reviews and customer service." What's more, Landmark was able to replicate the bear-head logo down to the very last detail. Few other firms were capable of such precision craftsmanship. According to Leslie, the new inflatable sports tunnel has sparked excitement throughout the college community. As an added bonus, he says, it has cost the university next to nothing: Pepsi, a prominent sponsor of the school's athletic program, paid for the entire project.